These days I tend to leave Visual Studio more and more often for doing simpler things that don’t require the full power of Visual Studio’s development tools like IntelliSense, the powerful debugging tools and ReSharper refactorings. My preferred text editor for the more light-weight work has become Visual Studio Code which, despite the name, does not have anything to do with Visual Studio. Except that it’s Microsoft that is behind it (their marketing department no doubt had some influence in the naming process). Just like in the Visual Studio case, I cannot help myself from meddling with the configuration options, so I though it might be a good idea to write down what I have done. 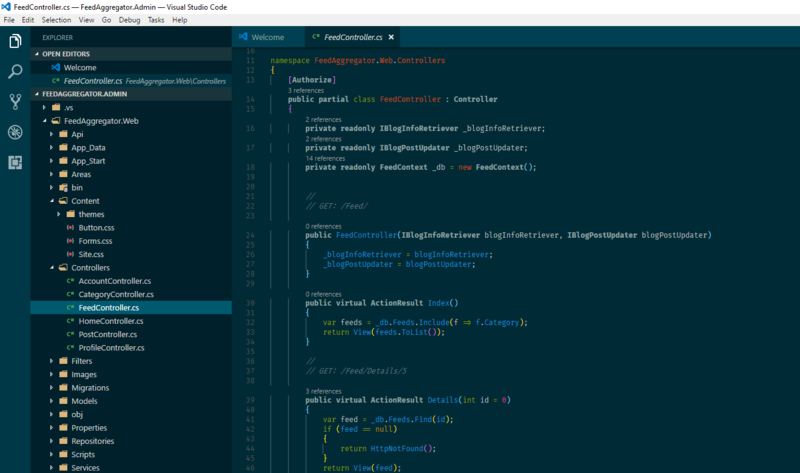 Just like for Visual Studio, I’m using Solarized Dark and switching to that is easy since it’s built in into Code (File/Preferences/Color Theme). Open the command palette by pressing Ctrl + Shift + P and then type Developer: Inspect TM Scopes. A window opens, showing information about the current scope: In this case it’s comment. Moving the cursor will update the scope information in the window. Close it with the Esc key. Saving the settings files makes it take effect immediately, without restarting the editor. In addition to foreground color, it is also possible to set the the font style to “bold”, “italic”, “underline” or a combination. You can also override colors in the editor UI framework using the workbench.colorCustomizations setting but I won’t cover that here. Microsoft has some good documentation of what can be done. The above takes care of the basic color highlighting of files but I also use a few extensions for Visual Studio Code that I feel are worthy of mentioning in a post like this. 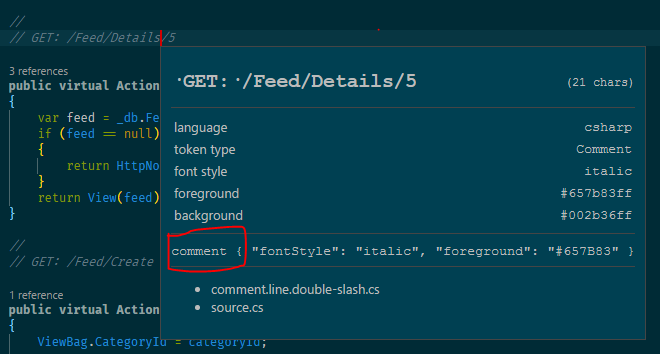 Adds the rainbow parenthesis feature to Visual Studio Code (matching parentheses and brackets have the same color which is different from the colors used by nested parentheses). It works really well and has configurable colors. This extension is actually written by yours truly and is used for visualizing different items in log files, such as dates, strings, numbers, etc. By default it associates with the .log file extension but it can be configured for other files types as well. It’s also easy to temporarily switch to the log file format by pressing Ctrl + K, M and the type Log File in the panel that opens. This extension adds really nice icons to the folder view in Visual Studio Code. It looks much better with this installed. Sort lines is a little extension that has nothing to do with colors but I think it’s worth mentioning it anyway since I find it very useful from time to time. It adds several commands for sorting text, the one that is a bit unique is called Sort lines (unique). What it does is to sort the selected lines and remove all duplicates. very useful for aggregating data from data queries, log files etc. Once you get everything configured the way you want it, you have to repeat all the above steps on other computers you use Visual Studio Code on since it has no support for roaming user settings, which is a bit cumbersome. However, there’s an old trick that fixes that, namely to use symbolic directory link to a DropBox folder (or another similar file-sync service such as OneDrive) instead of the standard settings folder for Visual Studio Code. Close Visual Studio Code if it’s open. Move the settings folder %APPDATA%\Code\User\ to somewhere in your DropBox (or OneDrive) directory tree. mklink /d %APPDATA%\Code\User\ "C:\Users\easw3p\Dropbox\Shared\VS Code\AppData_Code_User"
(adjust the DropBox path so it matches your setup). Start Visual Studio Code again to verify that everything works. On all other machines that should use the same settings, just remove the default settings folder and create the symbolic link like shown above, and all settings should be synchronized across all machines. As a bonus, you have just enabled version controlled settings since it’s easy DropBox to show file histories and roll back changes in DropBox.